press release: Radical Sheep’s Stella and Sam nominated for Daytime Emmy! Toronto, Canada – June 16, 2014 – Radical Sheep Productions is proud to announce the multi award-winning Stella and Sam has been nominated for a Daytime Emmy Award! Stella and Sam has won Canada’s top awards including a Canadian Screen Award, Juno Award and Grand Prize of the Children’s Media Alliance. Now Stella and Sam heads to Los Angeles on June 20th to compete on an international scale! Stella and Sam is a pre-school television series produced by Radical Sheep, based on the Canadian book series by Marie-Louise Gay. It is produced by John Leitch and Michelle Melanson Cuperus with animation by Mercury Filmworks. Stella & Sam focuses on the relationship of nine-year-old Stella and her brother Sam. 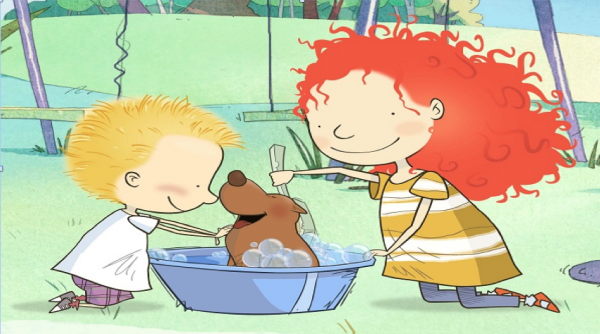 Stella with her red hair and BIG imagination is truly a star in the eyes of her four-year-old brother Sam. He feels lucky to have a big sister like Stella, who does ninety-nine things a day and wouldn’t dream of leaving Sam out of the fun! Besides, Stella knows everything, which is helpful when you’re a little guy who’s eager to explore theworld…as long as someone else goes first! As they explore the world around them, each encounters fun, adventure and self-discovery. Stella and Sam airs on Disney Junior Canada and Sprout in the US. Radical Sheep Productions is committed to developing, producing and exploiting innovative, entertaining and high quality content across multiple platforms. With over 400 episodes of award-winning series and successful licensing programs to its name, including the celebrated The Big Comfy Couch, Radical Sheep has been an established and acclaimed independent Canadian production company since 1992. This entry was posted on Tuesday, June 17th, 2014 at 11:31 am	and is filed under News. You can follow any responses to this entry through the RSS 2.0 feed.